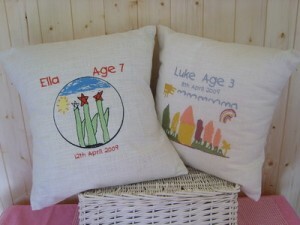 Heidi of Extra Special Touch Embroidery in the UK has come up with the cutest idea of converting children’s artwork into embroidery designs that she then uses to create cushions or framed artwork. Heidi says that most drawings can be converted, but not all, and that it’s best to use thick felt tip pens for the drawing, rather than crayons or colored pencils, and to limit the number of colors to no more than 10 for best results. Her gorgeous pillows are a permanent reminder of childhood memories and would make great gifts for grandparents, or terrific additions to your child’s room. Each design is stitched with the artist’s name, age and the date of the artwork, and can be purchased from Extra Special Touch for 39 pounds ($62 USD). 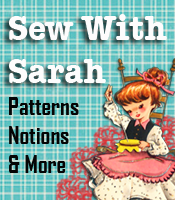 Consider having Heidi convert your child’s or grandchild’s artwork, or try your hand at doing it yourself if you have embroidery skills or equipment. These would also be a great product to add to your offerings if you have a custom sewing business – Heidi even takes orders for these at craft fairs and shows.